While I try my best to get my kids to eat well balanced meals and eat their veggies, I am often unsuccessful. You see, I have been cursed blessed with four picky eaters. This one likes sauce on their pasta, this one only likes butter. This one eats only peas and this one only eats carrots. Its very challenging and often frustrating. I hate to admit that when it comes to vegetables, my kids don't eat nearly enough. In fact the twins rarely ever eat any vegetables. I know there are recipes out there for hiding veggies in their favorite foods, but I honestly just don't have the time for the extra steps and work. Preparing dinner while four children circle me like sharks is challenging enough as it is. "Kids’ meals these days… a lot of them are downright scary and often loaded with all sorts of artificial ingredients. As a father myself, I decided that we needed more options for all-natural kids’ meals – the kind that are yummy and nutritious for children while convenient for parents." 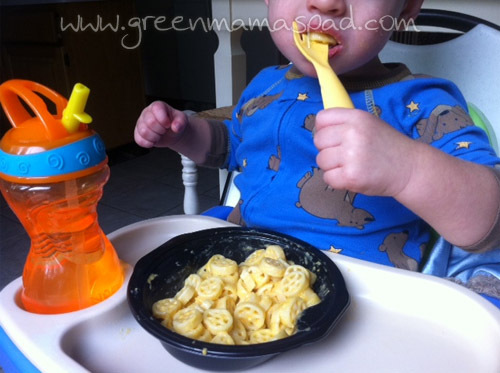 Kidfresh offers all-natural healthy kids food that even your picky eaters will enjoy. On those crazy days when you have to run around to pick up kids at school, band practice, hockey practice or all of the above, you can feel good about heating up one of these frozen meals. Kidfresh meals do not contain any artificial ingredients, each meal has some hidden veggies in it and the packaging is BPA free. I headed out to my local Big Y supermarket to pick up some Kidfresh meals to try out. I wound up choosing the Wagon Wheels Mac + Cheese, Totally Twisted Pasta + Meatballs and Muy Cheesy Quesadillas. I decided to try these out on my youngest since the older three are in school when he and I sit down for lunch. That would give us some quiet time for him to try these without any distractions. On the first day he tried the Wagon Wheels Mac + Cheese. 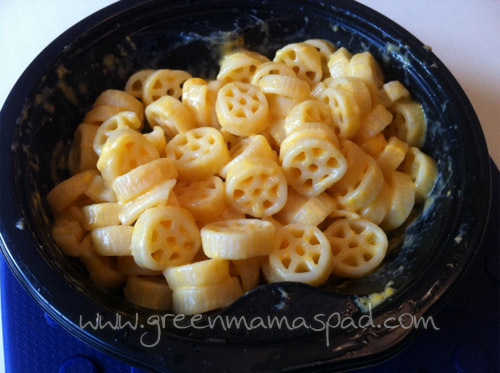 These cheesy pasta wheel have a secret - there are pureed carrots hidden in the sauce! After mixing it up well, I took a bite myself and was pleasantly surprised on how good this tasted. I passed it off to the toddler and watched for his reaction. I am happy to report that he gobbled up these wheels - he loved them! Later in the week he tried the Totally Twisted Pasta + Meatballs. This meal has a half a cup of vegetables mixed in: sweet potatoes, carrots and celery. He once again devoured the pasta, but he did pick out and the meatballs. Remember I told you - picky eaters. Mommy may or may not have eaten the meatballs for him. (They were yummy). Finally we tried out the Muy Cheesy Quesadillas, which also has carrots hidden in the cheese. What amazes me is that you don't taste the carrots in any of these meals. 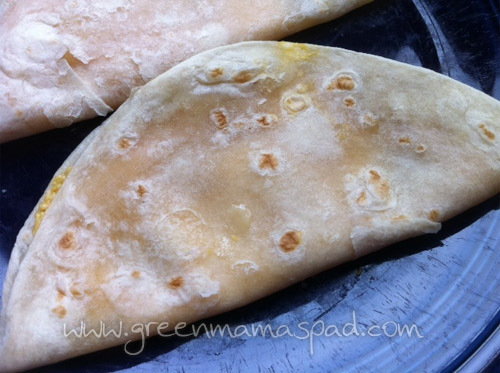 I was really surprised when my toddler didn't eat the quesadilla. He didn't even take a bite so its not that it didn't taste good, he wouldn't even tried it. I was actually surprised because I am make him quesadillas all of the time. I think his issue might have been that it looks different then the ones I make so that is why he wouldn't try it. However during last week's five day power outage, I had thrown some of my perishable food in a cooler to bring with me to my in-law's and I had one package of the quesadillas left so I brought it with me. I made it for my six year old one day for lunch while we were staying there. At first he questioned it but after one bite that was it. He ate it and asked me for another one. He said it was "the best quesadilla I've ever had!" (Thanks a lot Kidfresh, mine will never be good enough again). 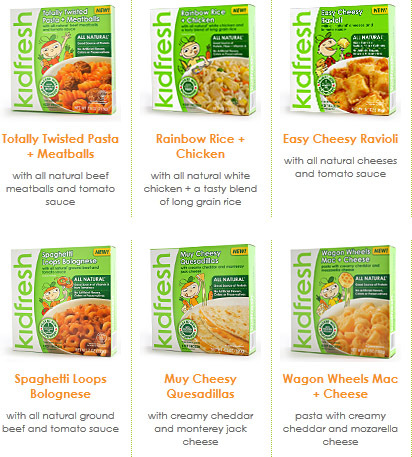 Overall we were very pleased with the Kidfresh line of frozen meals. I am hoping our Big Y will start carrying more of a selection of them since right now they only have four. While I would never suggest replacing a home cooked healthy meal with a frozen meal every day, these are great to keep around in a pinch. Families are busy and its great to have an option of healthy, all-natural frozen meal for the kids when you need it. Become a fan of Kidfresh on Facebook and download a $1.00 off coupon. One (1) winner will receive three (3) coupons for free Kidfresh products. Please use the Rafflecopter entry form below. I think my daughter would like the Totally Twisted Pasta + Meatballs. Thanks for the giveaway! 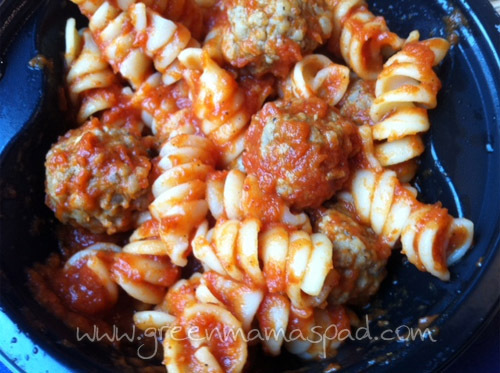 Muy Cheesy Quesadillas and Totally Twisted Pasta & Meatballs ヅ *Thanks* for the giveaway! My kids would totally love these! I haven't seen them locally but I'm definitely going to look again. My niece would love the wagon wheels. Perfect for when she is visiting!